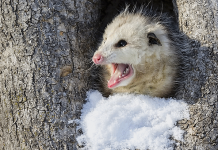 The Virginia opossum (Didelphis virginiana) or the common opossum one that occurs in the United States, are thought to give as many as 20 babies at one time. However, not all of them can make it to adulthood. As a matter of fact, only half of babies survive. Studies suggest that there are some babies that can’t even make it to the pouch. How Many Babies Can a Possum Have? Unlike North America opossums, the Australian possums are not really reproductive in that they mostly give birth to two offspring only in one litter. Since the female has only four teats she can afford to rear two babies at a time. Ringtail possums will produce babies from August to November. The rock ringtail possum likely rears only one offspring because the female has only two teats. Similarly, Leadbeater’s possum give birth to 1 – 2 babies in May to June or in October and November. In opossums, about 13 to 15 young can attach to the mother’s teats but most of them are unable to survive. The female common brushtail possum will rear only one offspring. Since the young are born at a very early stage they find it extremely hard to make it to the outside world. Most, if not all, babies die in the pouch.